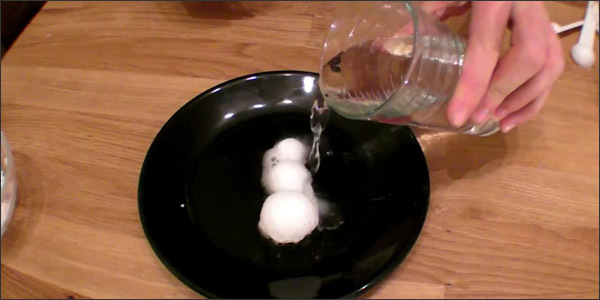 Watch Scientist Joe create this Sizzlin’ Snowballs Experiment here! Add baking soda to water until baking soda becomes packable dough, not runny or watery. Shape into a ball. Use pipette and vinegar to put drops or squirts of vinegar onto your snowballs. Watch them sizzle as if it is spring! Try adding blue food coloring to the vinegar. Does this change the experiment physically or chemically? Try warming up the vinegar before you squirt it onto the snowballs. Is the reaction different? Why? Reverse some of the steps. Instead of making the snowballs out of baking soda, freeze vinegar and then pour baking soda on top. Does this make the reaction better, worse, or the same? Try to make your Sizzlin’ Snowballs into a Sizzlin’ Snowperson. Stack three snowballs on top of each other, then add buttons and black beads for the eyes. Add orange foam for the nose. Top it off by adding red and green glitter to the baking soda mix to add a pop of holiday color.